Nice product, well made and finished. Would recommend. Too big for me but that's not your fault. Beautiful product. Really good product. Totally happy with it. Just too big for my weedy fingers. Here you will find the whole titanium ring collection. Titanium is lightweight, very strong and hypoallergenic. Use the menus to filter our large selection based on your preferences. Each product description page features a handy guide to your ring size. Titanium is a relatively new material in the manufacturing of jewellery and it has become more and more popular. Titanium also has some unique characteristics that make it very suitable for the production of rings. The precise composition of titanium can vary a little. Simply put, you can use "pure titanium" that is at least 99.2% pure or aircraft grade titanium whose purity hovers around 90% with the balance being basically aluminium. Titanium is hypoallergenic, biocompatible, which means that it cannot cause any allergic reactions, so it is therefore particularly suitable for those with sensitive skin or metal allergies. Titanium has the highest strength to weight ratio as compared to all other metals. 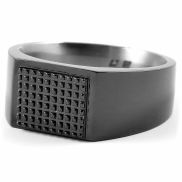 Titanium offers the wearer a great feeling and comfortable ring . Titanium is very strong and much harder to scratch than a steel ring. 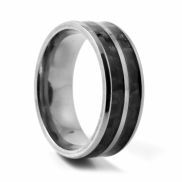 Titanium rings are very resistant to corrosion even when exposed to salt water. Because titanium is so strong, it might be a challenge to resize the ring. 1. 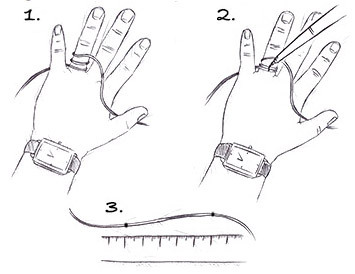 Twice around your finger, tie a thin string. 2. Put a line so that both strings will show a mark. 3. Measure the distance between the two marks, that is your C number.